No matter the products or goods you store Cisco-Eagle has an effective rack or storage system to make the space you use more productive. Whether first-in/first-out or fast moving sku's, our engineers can design a storage system to fill the need. We offer flow rack, pushback, drive-in, drive-through, and flow rail to accommodate your loading and pulling needs. We have standard pallet, cantilever, stacking, sheet metal and records storage rack ready to install depending on what you store. Give us a call and we'll help you out. 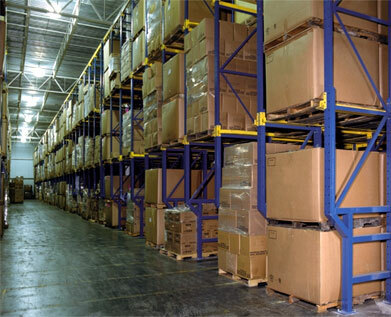 Finding the right pallet rack system for your facility can be tricky. Let Cisco-Eagle assist you in rack selection, system design, and installation. We'll help you increase throughput with efficient design. Use cantilever for storing round, bar, tube and square stock like pipe and conduit. Extended arms support goods while allowing for the use of lifting equipment to access the inventory. Keep old records safely stored on sturdy rack that fits standard record boxes. Rack is accessible from all 4 sides. Helps you keep records organized for retrieval. Use stacking rack for bulky, hard to manage inventory storage. As more storage is needed, add more layers of rack. Rack columns support the rack levels to provide open storage that is stable under load. A great solution for storing sheet metal of all kinds. From vertical storage for lightweight sheets to roll-out shelving for heavier loads, these racks get sheet stock off the floor and better organized. Metal roll-out rack provides organized storage space for heavy sheet metal, machining tools and die. The shelves roll-out on heavy duty steel bearings to allow the use of lift equipment for safer handling and manipulation. This extra-wide rack allows the placement of a full 8' sheet of decking to be installed across the beams, making space for bulky materials that are hard to handle.